In the business world, amortization simply means paying off a loan or a debt in regular payments over a set period of time. The most common form of an amortizing loan is a mortgage, but car loans and other major and expensive purchases involving a loan are also examples of amortization. An amortization loan is different from other loans because each payment installment includes both principal and interest. It is also among the easiest loans because payments are split into equal amounts that will remain unchanged throughout the length of the loan. There are a few tools at your disposal to help you with an amortizing loan, most notably a calculator, schedule and spreadsheet. On this page, we will delve further into amortization, how to use an amortization calculator, schedule and spreadsheet, and how amortization can help you secure the home or vehicle of your dreams. Buying a home or a car is a major investment and there are some things anyone in the market for a loan should know. Prior to entering any type of amortization loan, it’s important to speak to a qualified financial advisor. It’s also important to figure out how much money you’re willing to spend and how long you’re willing to spend it prior to ever stepping foot in a loan office. Going in with a clear head and set numbers in mind gives you a huge advantage when you sit down with a loan officer. Don’t allow yourself to be talked into committing money that you don’t have or don’t want to spend. There are many benefits associated with an amortization loan, but those benefits will be meaningless if you enter into an agreement you can’t afford. Prior to signing your name to any piece of paper, use tools like an amortization calendar or calculator so you know exactly what you’re planning to get in to. A lender’s first priority is not always placing you in the home or car of your dreams. Lenders have a job to do and some will do all they can to earn every last penny. Some will see an inexperienced or uneducated consumer and jump at the opportunity to put them in a situation they would rather not be in. As with anything in life, knowledge is power and the more you know going in to this life-changing experience will pay huge dividends both immediately and down the road. An amortization period refers to the amount of time it will take you to pay off your debt or loan. If you decide to take out a loan and attempt to pay it off in a timely fashion, you can expect to have higher installment payments. However, you won’t pay as much in interest because the loan will be paid off faster. Conversely, those who take out the same loan but wish to take a little longer to pay it back will have lower installment payments, but will pay much more in interest over the length of the loan. Depending on interest rates, and other terms and conditions, even extending a loan by as little as one year could results in paying tens of thousands more in interest. Determining an appropriate amortization period is one of the most important decisions you will make prior to agreeing to the loan. Using an amortization calculator and schedule prior to ever meeting with a lender will help you determine what period will work best for you. An amortization calculator is invaluable when it comes to determining the costs associated with a loan. These calculators can be used for auto loans, mortgages and various types of other loans. An amortization calculator is also very easy to use. First, input whatever the amount of the loan is. Next, you will input the length of the loan term, whether it’s weeks, months or years. The next step will be to plug in the interest rate of the loan, followed by the starting date of the loan. Finally, select whether you would like to see the final result in monthly payments or yearly installments. Once you determine the amount of your payments, it’s important to remember to include any taxes, insurance or any other type of fees or charges that may be added. If you’re paying off a loan, you need this amortization schedule to show you where you are in paying off the principal and interest. Amortization is the process of paying down the principal and interest of a loan slowly over time, until the entire loan has been paid. Typical examples of amortized loans are home mortgages and car loans, but amortizing loans can come in all sizes. To create your own amortization schedule for loans, download this easy template. Creating an amortization schedule for your loan has never been easier. Simply plug in your loan amount, interest rate, and term, and this amortization schedule will figure out how much your payment is, and how much of each payment goes to principal and interest on the loan. This loan amortization schedule tool will help you see how close you are to paying off your loan, and how much interest and principal you have paid. Thanks to this amortization schedule tool, you’ll have a much better understanding of your debt. Our amortization schedule Excel template is easy to use and requires only a few variables. It also produces a chart that is easy to read, so you can fully understand your loan amortization schedule. If you need help creating an amortization schedule for auto loans, mortgages or any other type of loan, simply download this template for free today! 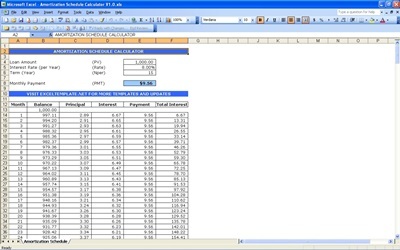 This amortization schedule Excel template is very popular with visitors to our site. If you find it helpful, check out the rest of our website to see what other helpful templates you can find. We provide Excel templates and calculators to help you deal with many areas of your life.